Jackson Tan is one of the Singapore’s most successful designers, an artist, and a curator. He is the man behind Singapore’s national branding SG50, and some of his artworks have been presented at Singapore Art Museum. He is also my parter-in-crime. I met Jackson when I started my audacious Customer Experience journey in OCBC Bank 7 years ago. He believed in our vision that design could make banking human and beautiful. We worked on projects such as simplifying complex investment forms and insurance communications. The result? 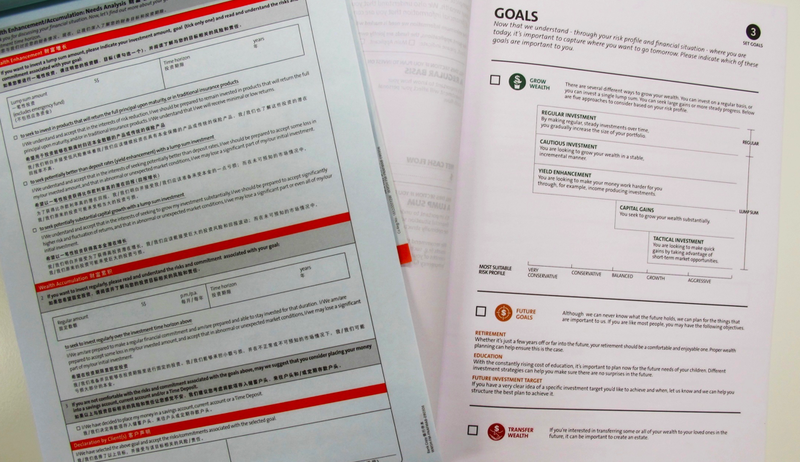 Not only the simplified forms cut down the time it had taken to fill out but also improved the clarity in making decisions. Our collaboration went further. We experimented a new idea around the role of art in banking. 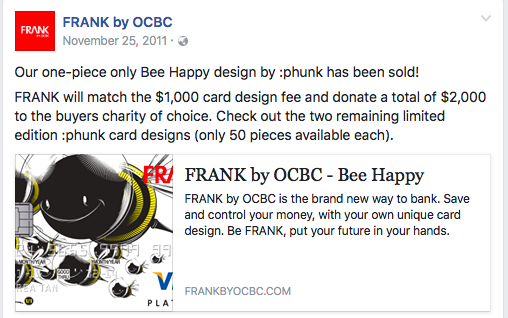 The limited art edition, the one-piece only card for FRANKbyOCBC which Jackson and his team at PHUNK created was sold at $1000 three days after we had launched. Our mutual passion for beauty and human touch have developed over occasional lunches and coffee chats. Now as the 3rd issue of Designful Leaders, we talked about what he learned about simplicity from his latest research on ‘symbols,’ his simplification process and what businesses can learn from the practice of art. The highlight of our conversation has to be his philosophy of ‘Clear is more’ the idea that businesses should focus on ‘clarity’ rather than ‘reduction’ in achieving simplicity. [Jin] What is your biggest passion at the moment? [Jackson] One of the things that fascinates me is symbols. When I was a kid, I was very into drawing especially around superhero comics and cartoons. And I was very fascinated with Superman, Batman and Wonder Woman. I was not very good with drawings the physician form of the superheroes; I was really into their logos. Back then I didn’t know these were called logo or symbol. I just loved it. Why? Because it was very simple and unique. I could draw it in three seconds. Has your passion for Superhero symbols influenced you when you embarked on the national brand project ‘SG50’ for Singapore government? I guess many of my works as a designer and as an artist has always been revolving the idea of symbolism, what symbols mean and visualizing symbols and telling stories through symbols. Think about Batman logo. You know seeing the Batman logo fleshed out in the sky the logo embodies so much about his beliefs, personality, and the stories. 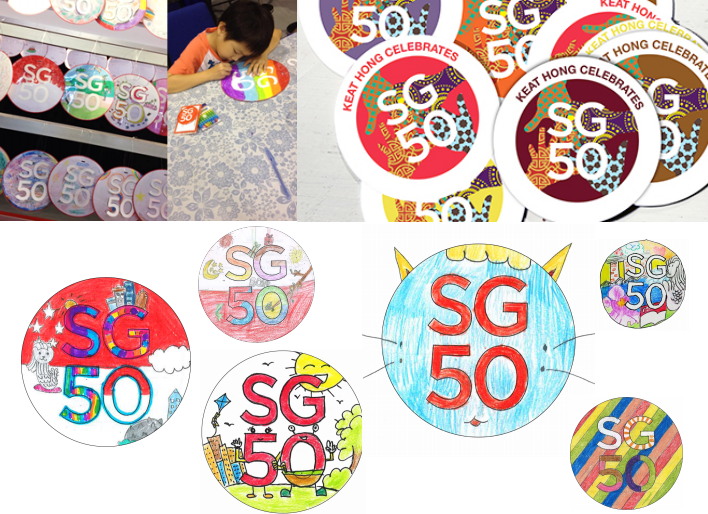 When I was working on the SG50 logo, I realized Singapore, as a small nation was represented as a red dot on the map. The red dot tells you what Singapore is. And that might not be a good thing because it is somewhat a disadvantage that we are so small. Yet it is our advantage as well. So for a brand, if you take your weakness and make it into a strength and celebrate it. That’s when you are the most powerful. I found the name itself, SG50 is simple, easy to remember and strong. I was inspired by ‘I love (heart) NYC’. It’s really simple. I wanted a logo that a kid can draw in 5 seconds. So like the Batman logo, something that you can draw in 5 seconds. Simple yet embodies a lot of meanings. I’m very interested in your simplification process. What kind of process did you go through in order to get the essence? I looked at the Google map. I went back and looked at it in the most macro way. Looking at Singapore in this position in the world, I realized that it is represented by a red dot on the map. Then I got it. It’s the red dot. Just the red dot represents everything. We are the special red dot in the world, because we are the only country in the world represented by a red dot, whereas the rest of the world are a shape. 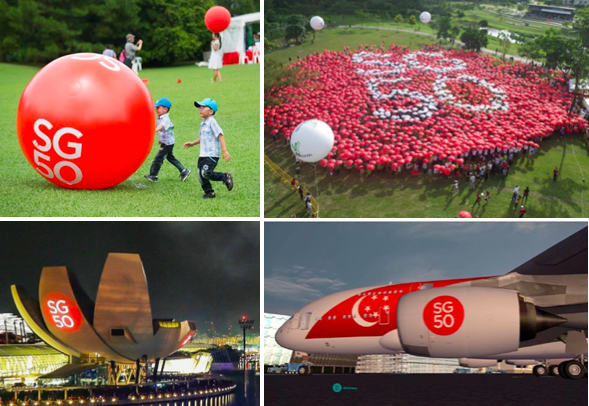 SG50 is so simple that children can enjoy and celebrate the nation’s birthday in their own creative way. What is your principles in simplifying process? For a while I was in the view of what most people say – less is more. Now I’ve realized that my mode of operation is ‘clear is more.’ It can be less or more, but clarity is the most important thing. This conversation reminds me of the complex investment forms we worked together many years ago. The idea we focused on was how do we make the form ‘clear’. Not just simple, but clear so that people understand what they need to know. That’s absolutely right. There is a world difference if we aim to ‘let’s make the form look simple,’ versus ‘let’s make it clear.’ The key part of the project was ‘reframing’ the problem. Instead of seeing the form as a form, seeing it as a conversation tool – helping users of forms in carrying out important investment decision. That reframing led us to take a radically different design approach regarding language and visual design. How would you explain the difference between the ‘design’ process and the practice of ‘art’? Most times design is very purpose driven. It seeks efficiency or a certain kind of outcome, clear message or clear objective. In design, most of the thinking is done in the front; then you do the work. Whereas for art, you are doing before you are thinking. The process is often longer, and it can be more painful. But it can be more insightful because it is like going to a place without a map and navigating with your instincts. So it will bring you to places that you’ve never expected to go. This reminds me the ‘FRANK limited edition’ card, our audacious experiment if ‘art’ can be a product in banking. Yes, I loved working with you on FRANK. FRANK brand promise was quite interesting. To me, it was about giving choices to people to express themselves. Banking products are typically built in a way that you can’t add any personality to it – the only evidence that it’s yours is the embossed name and numbers. FRANK card gives you a chance to express yourself visually, and we were briefed to create a special edition based on our art. You also founded a new company called ‘Methodology,’ which focuses on bringing design workshops such as infographics. How did you start? About four years ago, I was very interested in infographics, because it was something about data and graphics, which I believed to be a new area worth exploring. Along with my partner Brian, we wanted to go to Berlin to attend a workshop, but it was too cold and too far. So we called those guys in Berlin and asked them if they would bring the workshops to Singapore instead? They said, Yes and that’s how we started. We brought up demand for the workshops and then we grew with more workshop series, such as packaging, signage and design management. I love that the speakers of your workshops are “masters”; designers who practiced and mastered one specific area of design disciplines in depth. How has the response to your workshops been? Interestingly for infographics workshops, we have non-designer participants like civil servants, auditors and bankers! People from CPF (Central Provident Fund Board Singapore) came to our infographic workshops. And it’s amazing how they embraced infographics to change the communication materials and payment slips to make it clear. What would be the one design principle you want to leave with our readers? Jackson Tan is a Singaporean artist, designer and curator. He is the co-founder and creative director of BLACK, a multi-disciplinary creative studio (2002 – present), founding partner of PHUNK, a contemporary art collective (1994 – present), co-founder of METHODOLOGY (2013 – present). He has collaborated and worked with brands and organizations such as Nike, MTV, Asian Civilisations Museum, DesignSingapore, Herman Miller, UNIQLO, Levi’s and Tiger Beer. Notable projects include the brand identity design of SG50, to celebrate Singapore’s golden jubilee and the design of the Peranakan Museum. In 2013, BLACK was commissioned by Bureau of Cultural Affairs Kaohsiung City to curate and design ‘CREATIVE©ITIES’, an exhibition that “maps creativity in Asia-Pacific’s cities today”. BLACK was awarded ‘Design: Best of Category’ and ‘Independent Agency of the Year’ at the Gong Show 2014. PHUNK’s artworks are featured in numerous biennale, museum nd gallery exhibitions internationally, including MOCA Taipei, the Animamix Biennale, Design Museum (London), Gwangju Design Biennale, Singapore Art Museum, Venice Biennale and the Fukuoka Art Triennale. PHUNK collaborated with artists as diverse as musician The Rolling Stones and pop artist Keiichi Tanaami.